The mobile infant rooms have a maximum enrollment of six children per classroom with two teachers in each room. These classrooms typically range in age from 9-17 months. 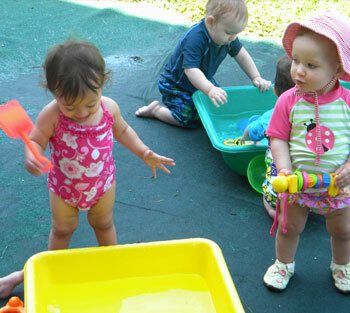 Infants reach many milestones during the first year. One of the most obvious is mobility. The classroom environment is arranged to offer different play experiences reflective of the needs of the “ever-moving” mobile infant. Our program focuses on growing independence skills such as; mastering self-feeding, sleeping on cots and walking. Also, graduating to table foods and use of sippy cups. We also foster use of language, listening and socialization skills. Activities, which promote small and large muscle coordination, are offered throughout the day. Typical small muscle exercises include; use of various art medium, looking at books and turning pages, and using manipulatives. Large muscle activities include plenty of opportunities to sit, crawl, pull up, stand, cruise, walk, climb and more. Daily activities include greeting and goodbyes, meals, routine care, story time, music/movement, self-selected activities, rest times, outdoor play including neighborhood walks. As in the young infants rooms, we continue to maintain daily written and verbal communication with the parents, which identify the infants’, sleeping, wake time, feeding, and toileting patterns. Mobile Infants change moment to moment. As they grow into more independent beings, it’s time to move on to the experiences ahead in the Toddler/Two's Room.